There are wild places left, in abundance, I was reassured during the last week. After living in largely cultivated flat Denmark for the last year, I began to forget what it was like to escape. What exists beyond the farmed fields, the pruned hedges and the paved streets? Thankfully some terrain can not be tamed, and we didn’t have to travel too far to be reminded of that (although we took the longer scenic way!). 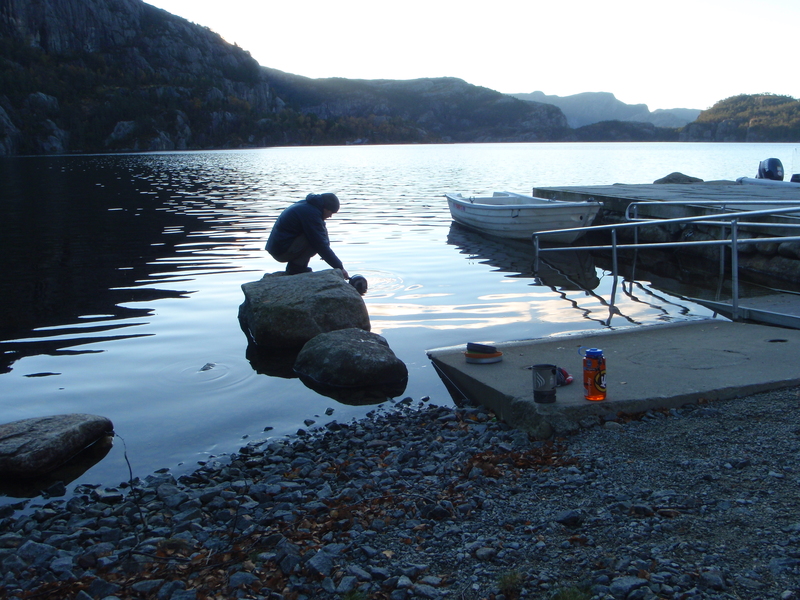 We embarked on a mini adventure to the fjords of Norway, armed with our tent and stove to sample some wilderness. When we arrived in Stavanger (our base of operations) we realised it was “out of season” and getting around using only public transport would be a big of a juggling act. In many situations busses and ferries run only once or twice per day, so our plans would be largely dictated by the man, well at least until we left the roads and wandered on our own steam. 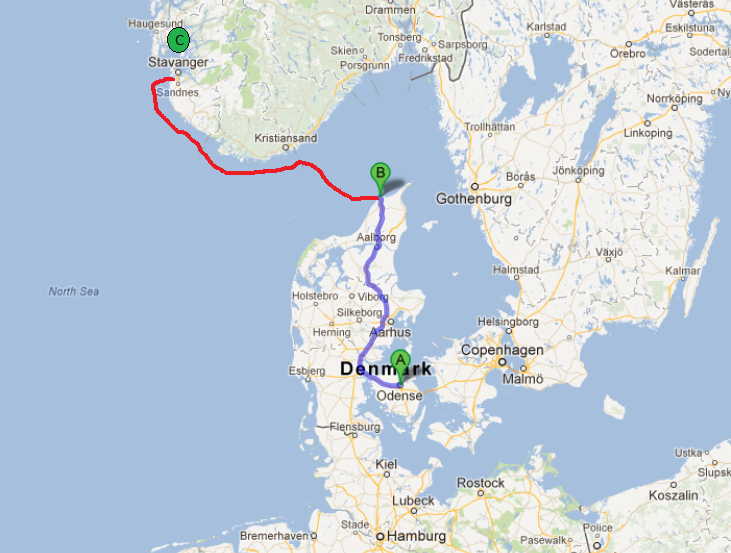 After a very comfortable night in Mona’s place in Stavanger we bought the necessary rations and a map and figured out the travel plans. 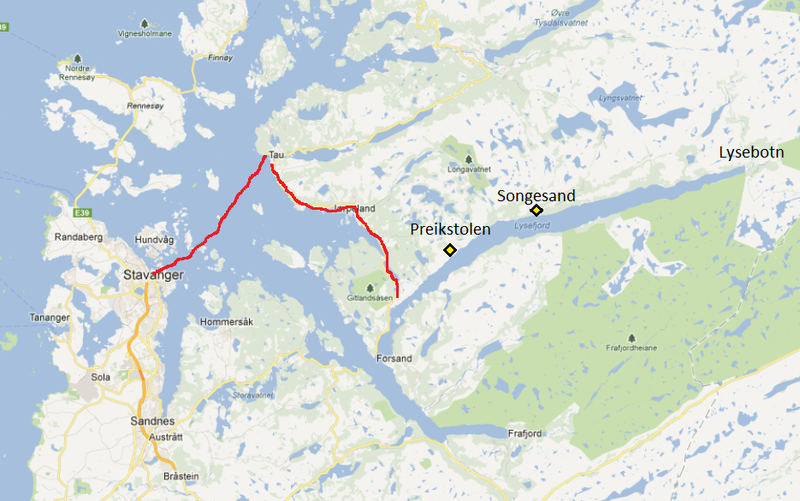 We had heard a lot about Priekestolen (translates as The Puplit Rock) and Lysefjord, so that’s where we headed. In Norway travelling by water is the way to get around. Land is a big rocky obstacle in the way, so you simply take to the water and go around. 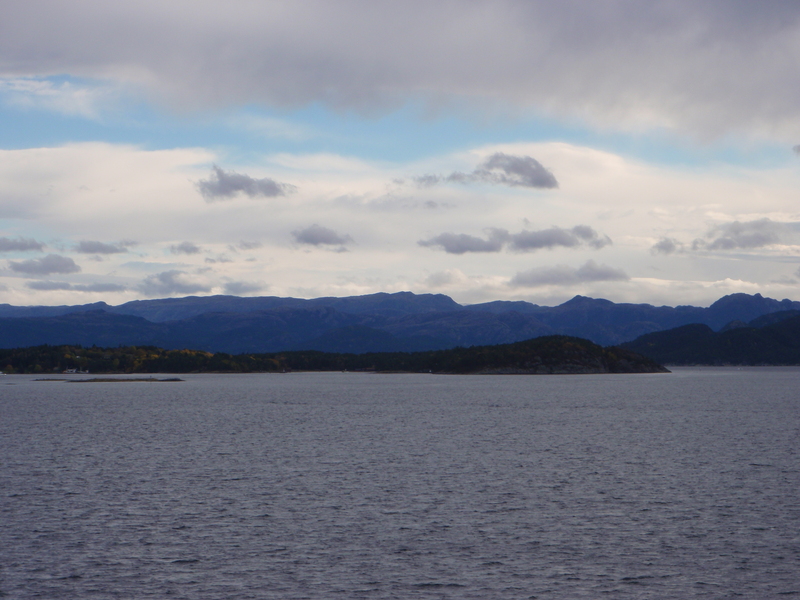 Our trip continued with a ferry from Stavanger to Tau, and a bus south towards the fjord. We managed to jump off at the side of the road next to a “path”. From there we followed a marked trail along the northern side of the fjord towards Lysebotn (the beginning of the fjord). We packed light, or so we thought! On the first day I’m sure I could feel every single gram in my backpack in every single step I took. We divided the essentials, and I ended up with the majority of the food – which is heavy! Thankfully water was never going to be a problem, as there were countless rivers, streams and freshwater lakes along our journey. Our diet consisted of oats (and magical milk powder), chocolate and countless cups of tea, nuts and dried fruit, cheese, tinned fish, crackers, noodles, fish cakes and sausages. Not the most gourmet selection, but after hours of challenging hiking, everything tastes good! On the bus between Tau and our start point, we met a friendly German (Lukas) and an energetic Australian (Justin). We headed out in the same direction, each of us with different goals amongst the Norwegian hills. From the start I was astounded. Withing 30 seconds we were in pure untouched wilderness. The only indication of a “path” ahead of us was the odd splattering of red paint on rocks or trees, which marked the way. 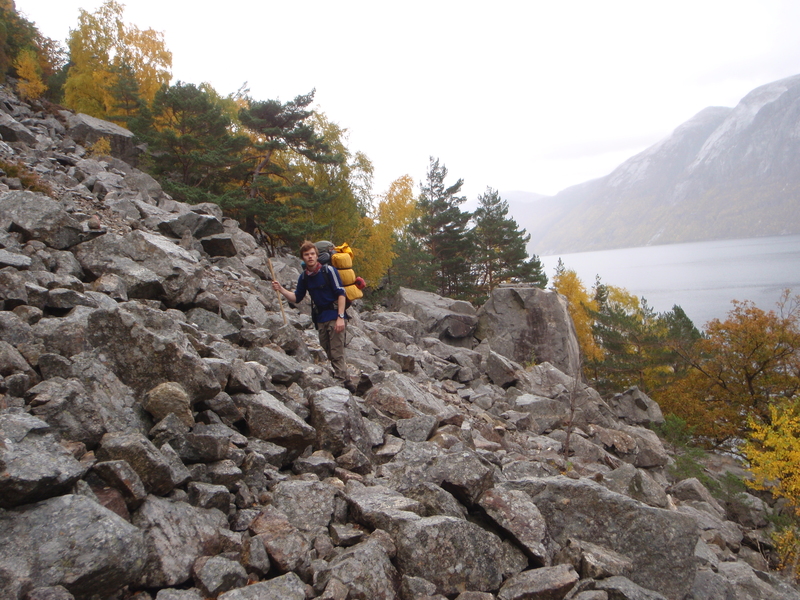 I very quickly realised there are no easy steps in norwegian hills. Every foot placement is done with careful consideration. If you wish to take in the view, you must stop. Multitasking is not an option. 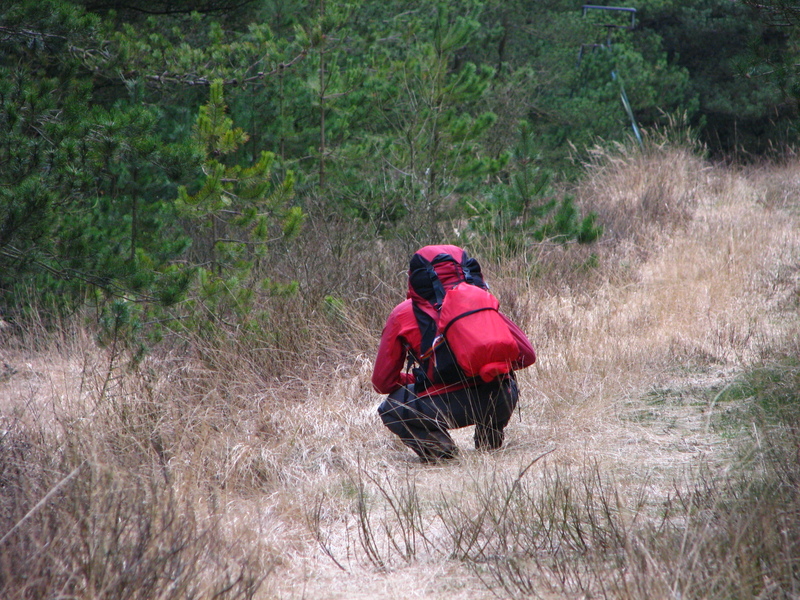 So photographing and view taking offered welcome breaks along the rough paths. There were points where I longed for some gentle rolling Irish hills. I admire those who first found and marked the routes in this area. There were times when we saw a red mark and wondered – really, you want us to go there!? On occasion we were provided with metal chains or hand rails, to help us feel less exposed I imagine. There were at least 2 locations where I can remember thinking, I am definitely climbing now. At one point, they seemed to have run out of metal and used thick electrical wires as hand rails – inventive! One of the most memorable sections of “path” has to be the scree slope/boulder field. At a section before Songesand the path ran along a steep section about 30m above the water level of the fjord. The mountain above had shed a large amount of scree and it was decided that the path would criss cross the debris. A mixture of large and small boulders had to be crossed and it was like walking on egg shells – memorable to say the least! Despite the hostile conditions, trees managed to grow here. Amongst the boulders they managed to take hold, or keep hold! 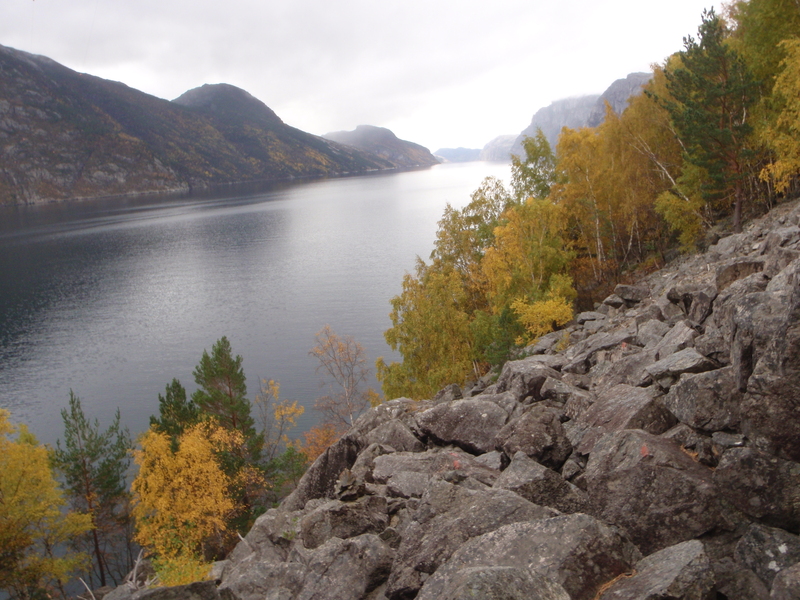 It was amazing to see and the autumn colours contrasted sharply with the deep grey of the rocks. The landscape was beautiful and surprisingly the weather was very kind to us. We knew we were taking a risk, heading north in the autumn, but it paid off. 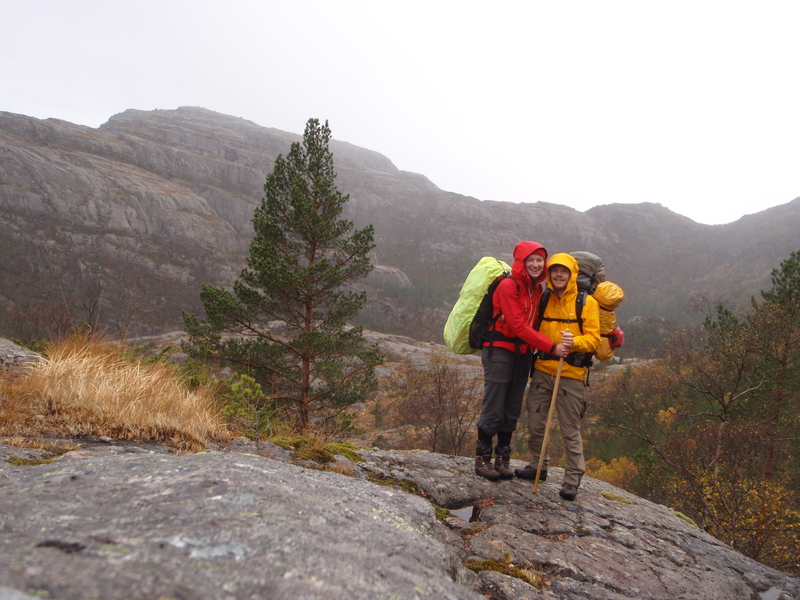 My waterproof jacket was tested only once in the hills, and the falling hail bounced off! In the distance we could see some snow, on the peaks above 900m, but we stayed in the slightly warmer lower areas. 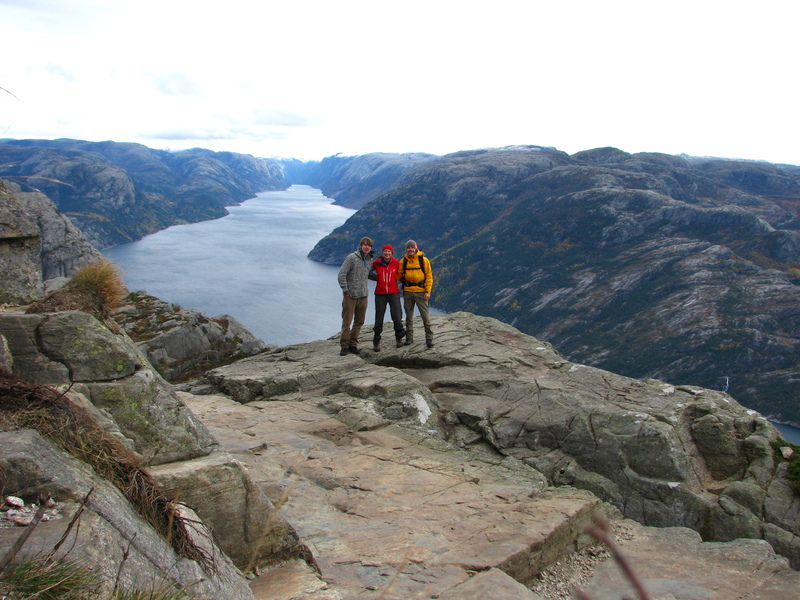 We did make it to Norway’s biggest tourist attraction – Priekestolen or The Pulpit Rock. High above the water on the northern side of the fjord a large platform of rock juts out. Although I usually avoid anything with the words “tourist” and “attraction” I would recommend a visit. After a challenging two hour walk, some of which is also rather exposed, you arrive at an impressive drop, which some (read me!) may find traumatising. The only thing to do when you get there is to get as close as you can to the edge and peer over, or sit out there if you are brave enough! It took a lot of nerve for me to even take photos of Rasmus casually wandering out there and taking a seat, some 600m above the water next to a sheer drop! I did manage to walk towards the edge and take the “safer” option of crawling, followed closely by lying down before briefly peeking over the edge. Seconds were enough, and I retreated. Even writing this brings back some strange anxiety in my stomach! 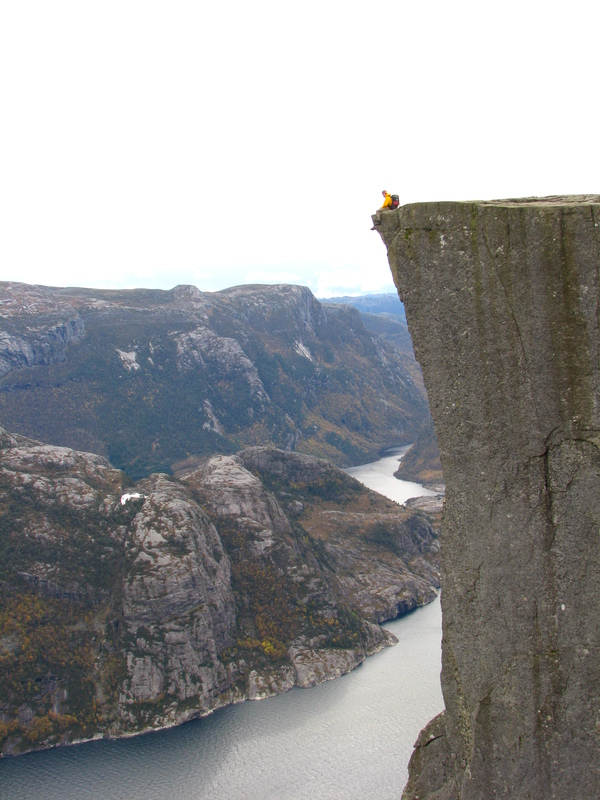 Rasmus relaxes on the edge of Preikestolen, while I panic behind the camera! In the afternoons we kept an eye out for a flat sheltered place to pitch our tent as we progressed along the side of the fjord. In an area dominated by rock, this wasn’t always easy. 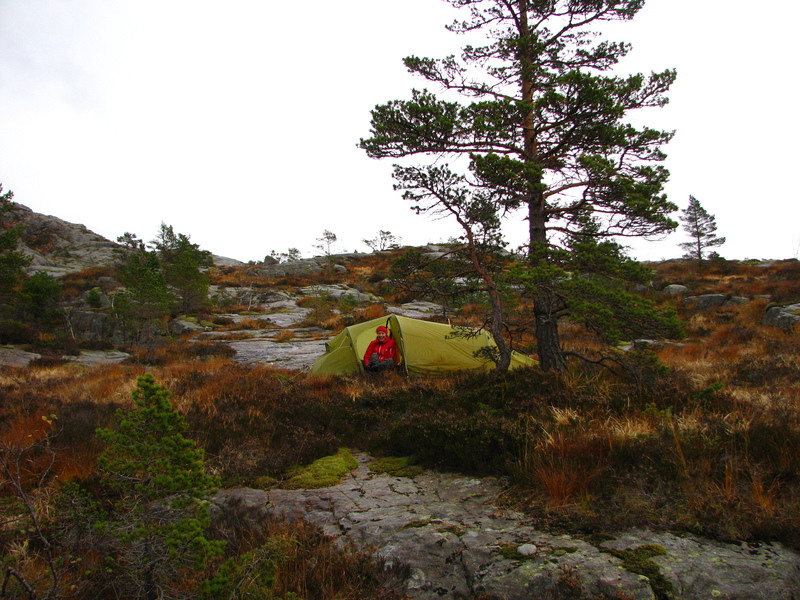 One night the only relatively flat and dry spot we could find was high up on a rocky outcrop. It was surprisingly flat and sheltered, but alas my overactive imagination ran wild and I had visions of wolves, bears and all sorts of wild animals coming to visit us. Needless to say I didn’t sleep too soundly, but luckily we were undisturbed! I later learned such animals live much further north, phew! In the morning over breakfast we experienced a small taste of the winter migration. 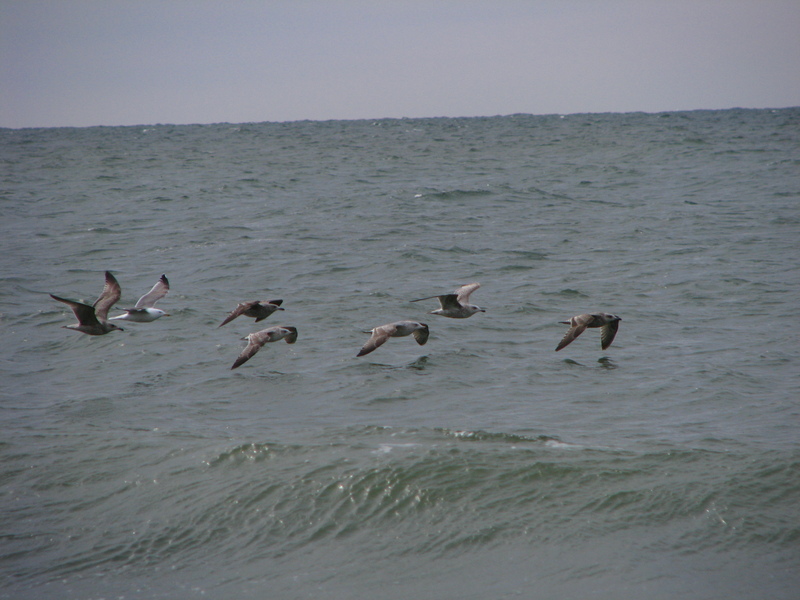 Above us numberous flocks of small birds flew south towards warmer lands – smart idea! Unfortunately our wander in the hills was cut short due to travel options and we made our way back to civilisation after 3 days. My wild itch was well and truly scratched and my legs ached! 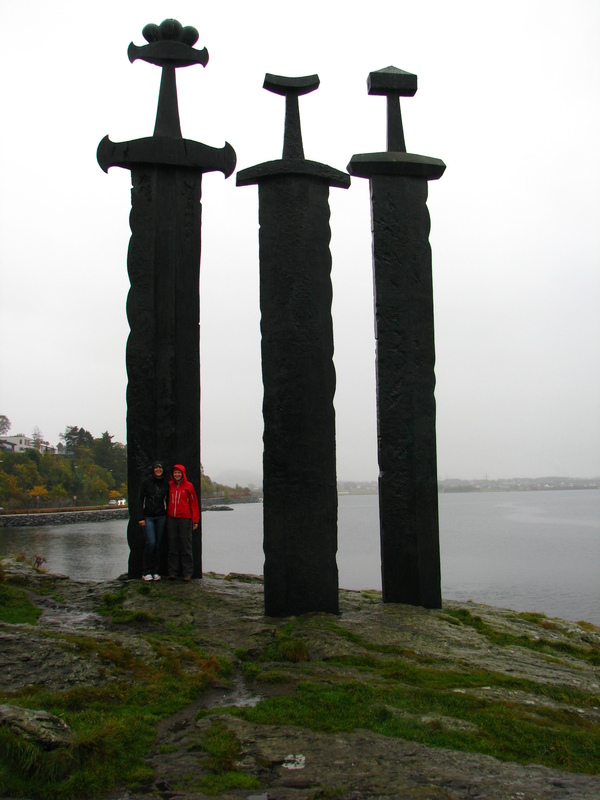 We caught a ferry from Songesand to Stavanger and spent the rest of our time being “normal” tourists. Stavanger is an oil city, and a large number of the employees of the oil companies in Norway live here. Back in the city, we visited the oil museum, where we learned all about the development of the industry in Norway. We also squeezed in a visit to the older parts of the city and a lovely colourful street where we drank the most amazing hot chocolate! On our last day we took a trip around the area with the lovely Mona. 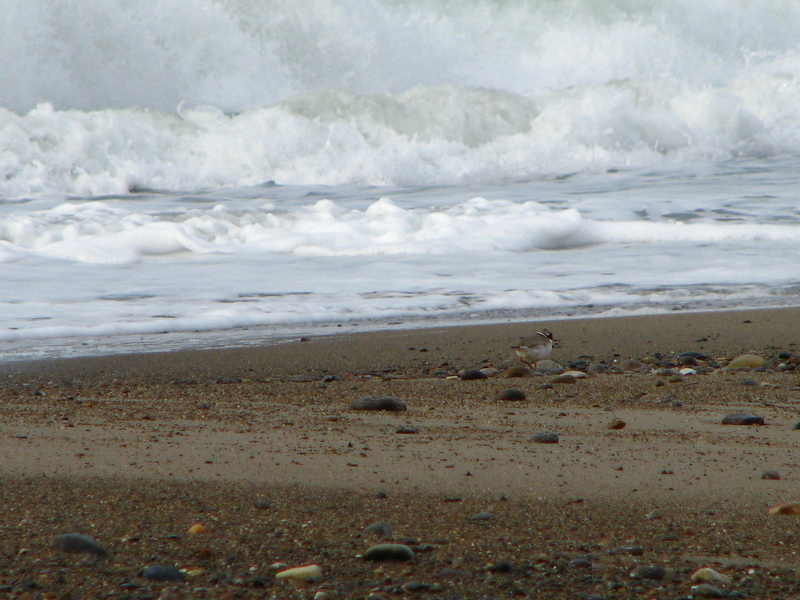 We visited beaches (where they surf in winter! ), swords, hills, shopping centres and found some traditional food. This was my first trip to Norway, and I am already planning to go back! Visiting the Swords with Mona – another tourist attraction ticked! 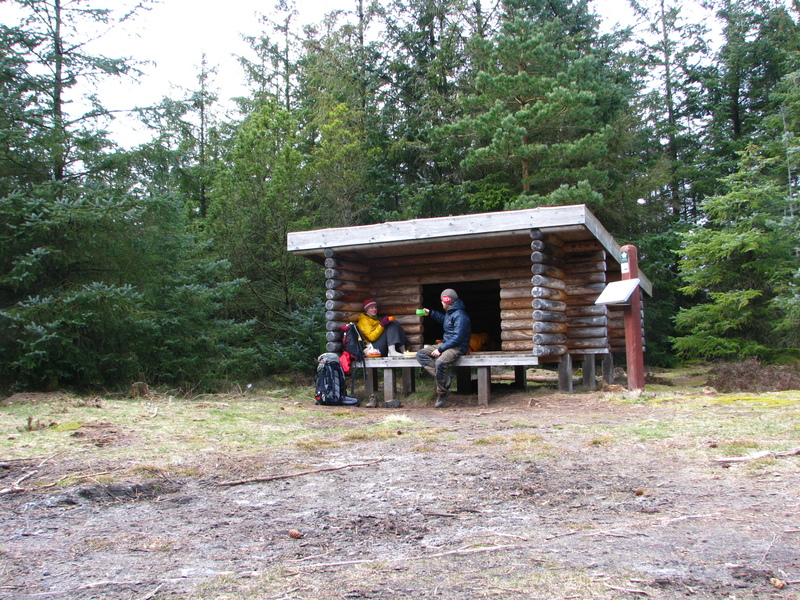 As a slightly alternative and less costly holiday this easter we went north to Jutland to wander for a few days in Thy National Park (see website, also in English!). Our walk began at Svankær went south, then west to the coast and north through Stenbjerg, Nørre Vorupør and then looped back to the car. Armed with gas stoves, dried food and large amounts and cheese and sausages we walked for 3 days and stayed in shelters for 2 nights. This wasn’t my first snail-like experience. There is something so appealing about carrying all you need to survive on your back. It simplifies things and allows you to focus on the nature around you with no distractions except maybe your sore feet! 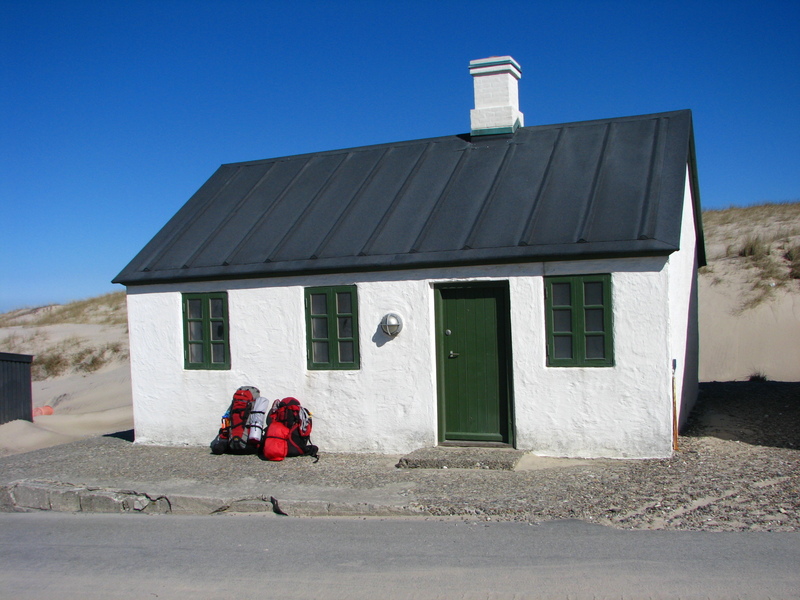 A Danish style shelter (like a big dog kennel) - our home for the night. We were blessed with fantastic nature as we wandered along wetlands, sand dunes and through forest plantations on Denmarks west coast. So far I have found it a little difficult to get close to Denmarks nature, or better said, away from Danish civilization! Denmark is a flat land, which allows for easy cultivation, and as a result a large percentage of the country is arable. This forces one to look a little closer, turn a few more rocks and wander off the path a little further to find the wild things. But believe me, they are there! Here’s some of what we found. 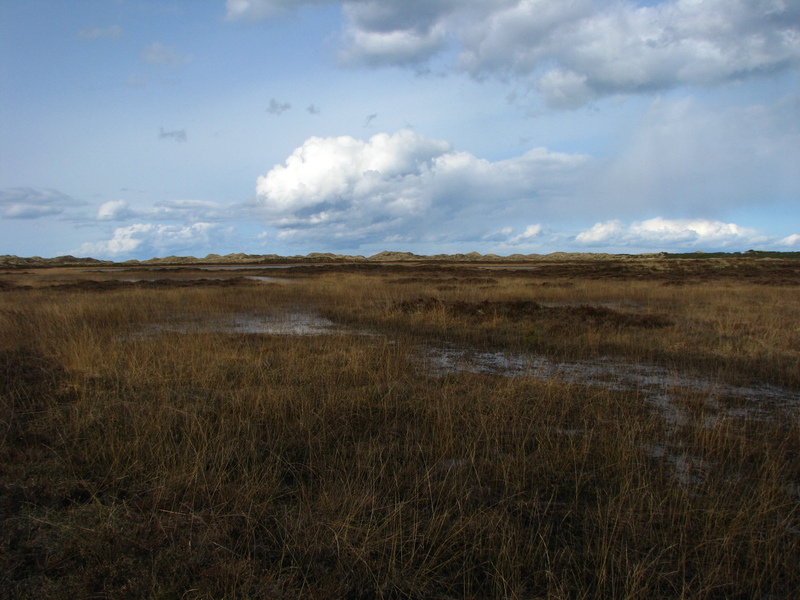 Wetlands next to sand dunes, near Svankær. Althought not in the picture...here we spotted two cranes (trane) flying overhead (a first for me!) and a group of 10 female red deer (kronhjorte). 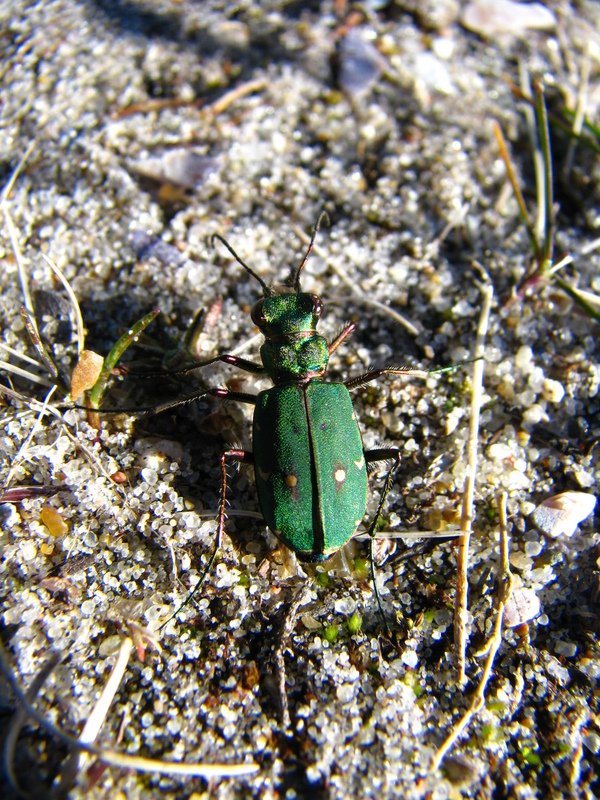 Green tiger beetle (Cicindela campestris) grøn sandspringer is a sun loving beetle that lives on dry soils. Green with cream spots. 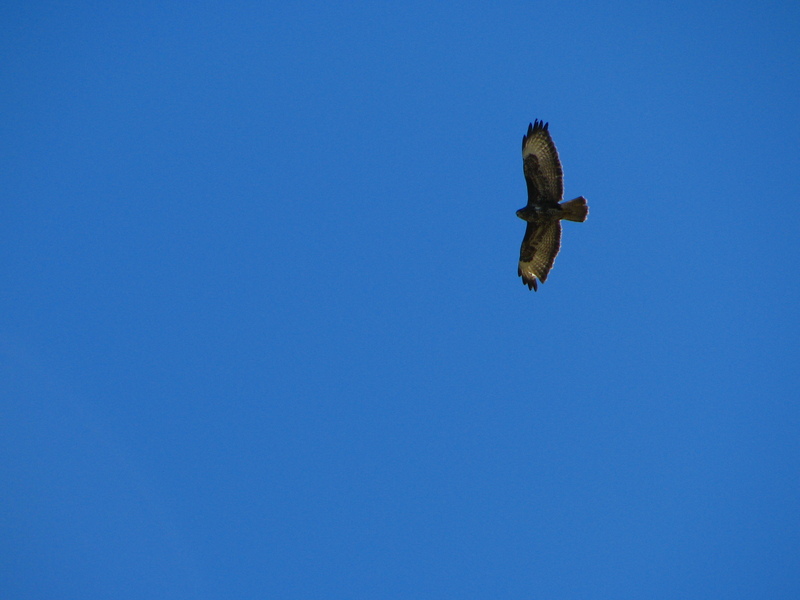 Buzzard (Buteo buteo) musvåge, soars above us in clear blue skies. If you look closely you can see it's missing one of it's primary or flying feathers. A very common bird of prey in Denmark. 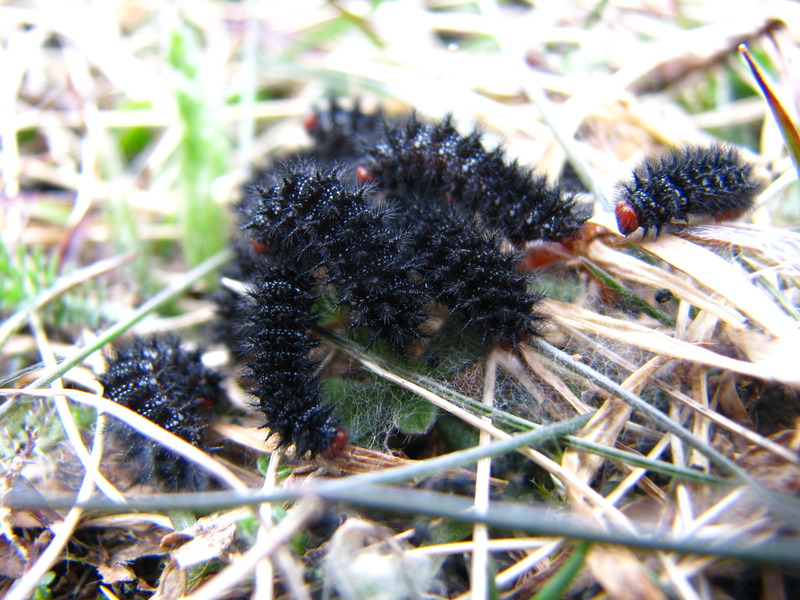 The glanville fritillary, okkergul pletvinge a type of butterfly spends most of its life as a small black spiny caterpillar. 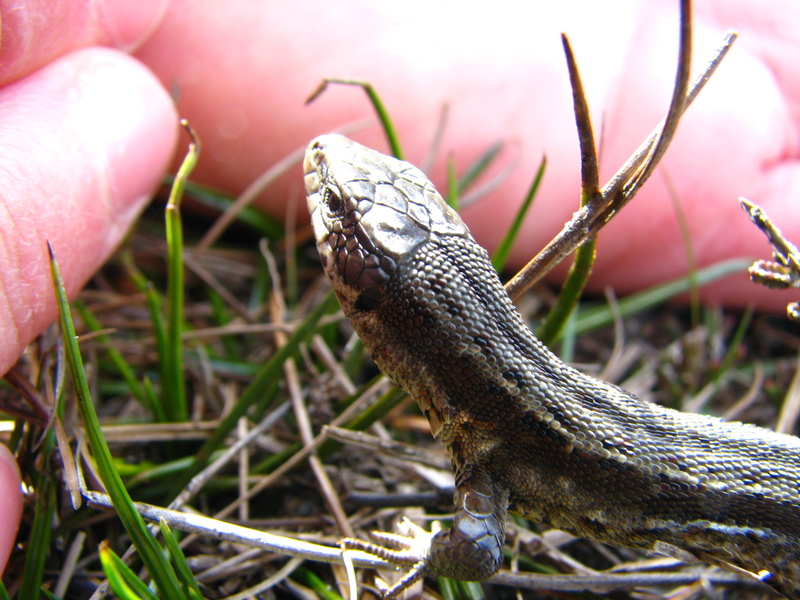 Common lizard (Zootoca vivipara) skovfirben - When the sun was shining we came across many small brown lizards like this one sunning themselves at the edge of the path. If it's a warm day, they can be very hard to get close to! 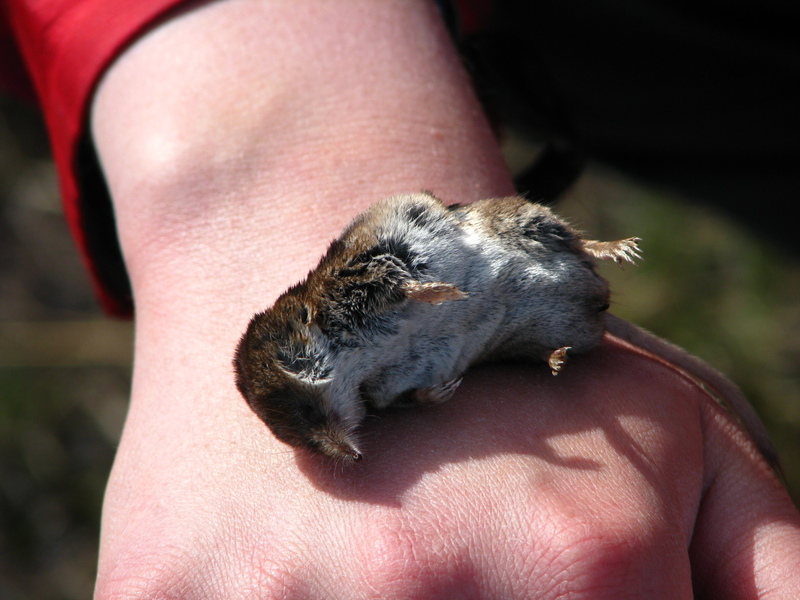 I have an affinity for small mammals, and we came across this dead shrew (spidsmus) and I had to pick it up! Getting closer, getting a better perspecitve, it's amazing what you will see. Common ringed plover - stor præstekrave. 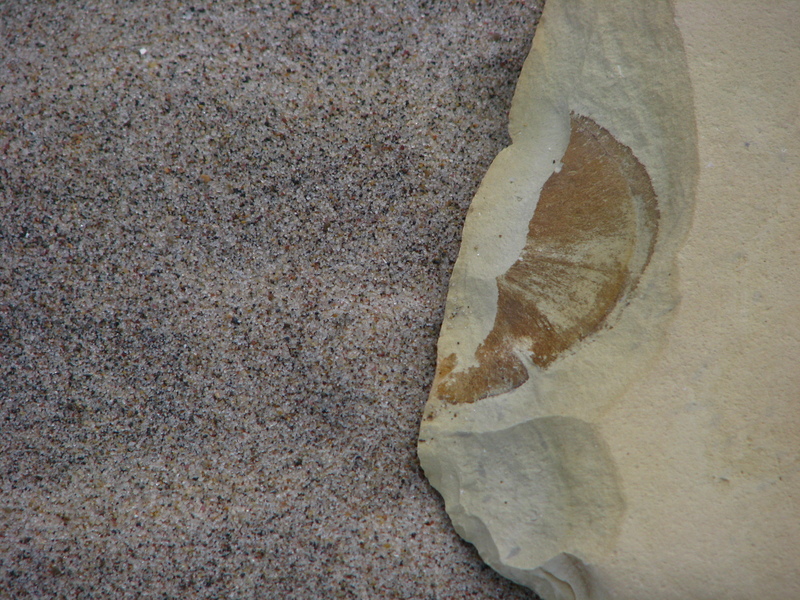 Hard to spot on a stony beach. Possibly herring gul (Larus argentatus) sølvmåge, most juvenilles. 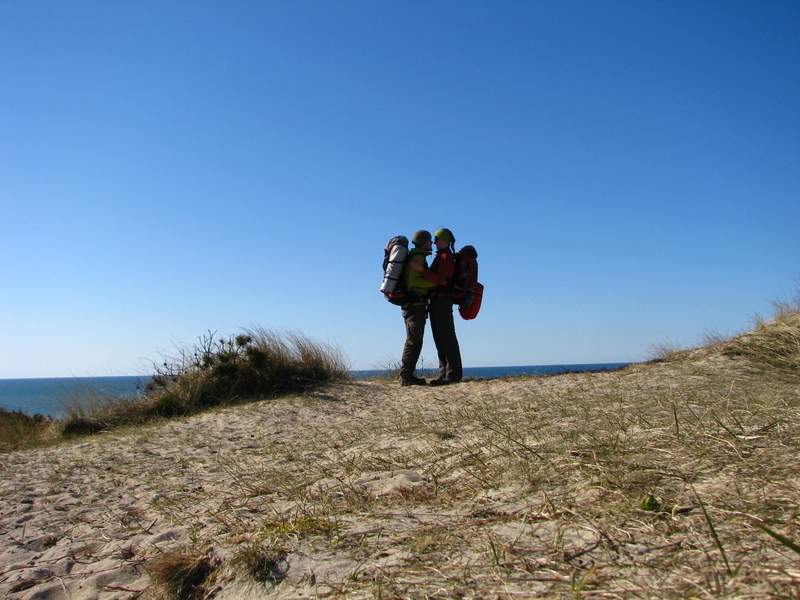 Our backpacks taking a well earned break at Stenbjerg in the sun. 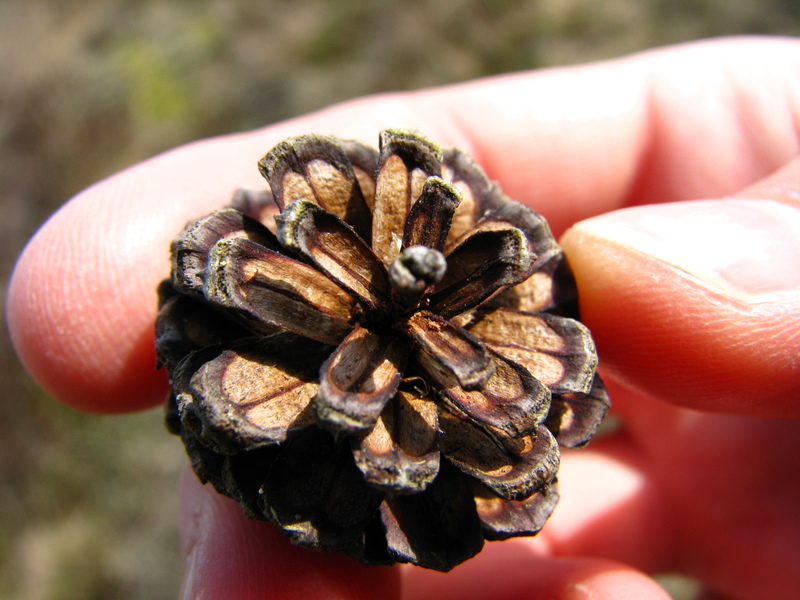 It’s taken me a while to learn to appreciate the more subtle beauty of nature here in Denmark. It’s an important lesson for me. I’ve been spoiled by large wild spaces in the past, but now my personal challenge is to find the beauty that exists in smaller amounts. Wild is everywhere, I just need to get better at looking.